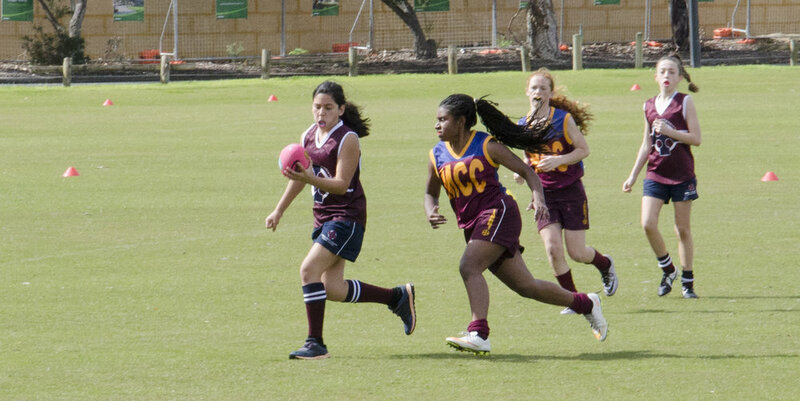 On the 8th of August, 18 eager girls travelled to Ferndale Park to play in the ACC Year 7 Dockers Cup Grand Final Carnival after qualifying the previous week. The team Captain, Jade Jerome, and Vice-Captain, Lauren Clarke, provided excellent leadership and kept up morale despite difficult wet weather conditions. It was evident throughout the day that this only gave the girls an opportunity to further their football skills as they learnt how to play effectively in wet weather conditions. From the start the girls proved they were switched on and they were able to win the first two games, defeating La Salle 19 to 27 as well as Emmanuel 2 to 28. Unfortunately the team experienced their first loss over the two carnivals against Mandurah Catholic College by a mere 17 points but they should be commended for leaving nothing left on the field.